These summaries provide information on the numbers of birds ringed and reports (recoveries) of ringed birds received for the whole Ringing Scheme, covering Britain and Ireland, as well as broken down by country and local bird recording area (in Britain) or county (Ireland). 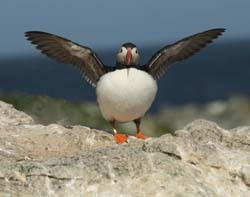 Information is included on birds reported to BTO during the selected year, though some of these reports will refer to individuals found in earlier years. Useful Notes: The bird recording areas used here are as outlined in this British Birds paper and are delineated by 1km grid square. A small number of squares are covered by two or more recording areas, individuals caught or found in these squares will appear in both summaries. Recoveries for a particular year are only shown if they were received by the end of April of the following year. When either the site of ringing or of finding is confidential, the coordinates given are deliberately inaccurate. Maps are only provided for movements of 20 km or further. View the timing of breeding and moult through the year for selected species and Nest Record totals by county. These totals are of ringing data that have been submitted electronically to BTO HQ. From 2010 this will include all records, totals for earlier years may be lower. These are the annual ringing totals for each species for each year since 1909 in which that species was ringed. If no individuals of a species have ever been ringed, then the species does not appear in the drop-down list. A summary of ringed birds found and recovered in the county or country in each year. Details are included for some of the most interesting recoveries. Summary information on where birds ringed in Britain & Ireland have been found, and from which countries birds have been recorded here. Details are included for some of the most interesting recoveries. For more details on the selections used, please see the Methods page. The BTO Ringing Scheme is funded by a partnership of the British Trust for Ornithology, the Joint Nature Conservation Committee (on behalf of: Natural England, Natural Resources Wales and Scottish Natural Heritage and the Department of Agriculture, Environment and Rural Affairs (Northern Ireland)), The National Parks and Wildlife Service (Ireland) and the ringers themselves.The Nest Record Scheme is funded by the BTO and JNCC. We hope you will find these summaries useful and would appreciate any comments for further improvements and enhancements. These should be emailed to ringing [at] bto [dot] org. The BTO Ringing Scheme is funded by a partnership of the British Trust for Ornithology, the Joint Nature Conservation Committee (on behalf of: Natural England, Natural Resources Wales and Scottish Natural Heritage and the Department of Agriculture, Environment and Rural Affairs, Northern Ireland, The National Parks and Wildlife Service (Ireland) and the ringers themselves.